[223 Pages Report] The rare gases market was valued at USD 245.9 Million in 2014, and is projected to grow worth USD 380.9 Million by 2020,to register a CAGR of 7.68% from 2015 to 2020. The increasing demand for lighting and laser applications, and the growing automobile and health care industries are the major factors driving the growth of the rare gases market. The market for xenon is projected to witness the highest growth between 2015 and 2020. In the end use segment, electronic application for rare gases are projected to grow at the highest rate. 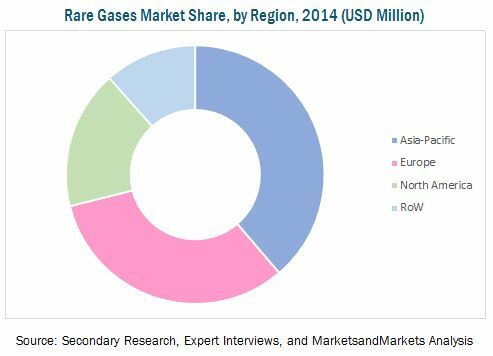 In terms of functions, the illumination segment accounted for the largest share of the total rare gases market in 2014. This report provides a full analysis of key companies and competitive analysis of developments recorded in the industry during the last five years. Market drivers, restraints, opportunities, and challenges have also been discussed in detail. Leading players of the market, which include Praxair Inc. (U.S.), Airgas Inc. (U.S.), The Linde Group (Germany), Air Liquide S.A. (France), Air Products and Chemicals Inc. (U.S.), Messer Group (Germany), and Iceblick Ltd. (Ukraine), and Iwatani Corporation (Japan) have been profiled to provide an insight into the competitive scenario in the market. This research categorizes the rare gases market based on type, end use, transportation mode, function, and region. This report provides five year market forecasts with important statistical and analytical information on the type, end-use, transportation mode, and function. This report provides a list of regulations relevant to rare gases at the regional level. This report illustrates industry structure, driving parameters, major players, market shares, industry dynamics, and international developments relevant to rare gases markets. This report provides detailing of each segment, on country basis for a holistic view. This report provides a competitive landscape, which is a presentation of the companies’ products and services. The rare gases market is purely application-driven and demand depends on various end users of rare gases such as electronics, manufacturing & construction, automotive & transportation equipment, and health care. The electronics segment is projected to dominate the rare gases market, by end user, from 2015 to 2020. The market is dominated by key players such as Praxair Inc. (U.S.), Airgas Inc. (U.S.), The Linde Group (Germany), Air Liquide S.A. (France), Air Products and Chemicals Inc. (U.S.), Messer Group (Germany), and Iceblick Ltd. (Ukraine). The market in this report is segmented on the basis of type, end use, transportation mode, function, and region. 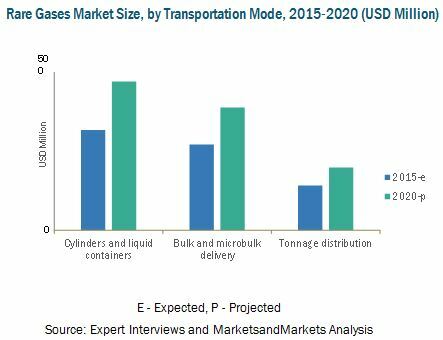 The cylinders and liquid containers segment is projected to grow at the highest CAGR of 8.18% from 2015 to 2020. Key players of the rare gases market implement different strategies such as expansions, agreements, contracts, joint ventures, and partnerships to gain a larger share in the market. Rare gases are a global commodity as they are not based on local production and supply; however, the pricing is highly dependent on the balance of global demand, supply, and speculation. One of the main strategies adopted by rare gas manufacturing companies is mergers & acquisitions. Companies are constantly investing in research & development activities to generate new ways to expand the market of rare gases to suit the growing technological requirements in various applications. Companies are adopting inorganic growth strategies such as acquisitions to cope with the increasing demand for rare gases in key emerging markets. These strategies have helped companies to create a large customer and partner base in key markets. 11.3.4.1.1 Xenon to Grow at the Highest Rate in the U.K.
13.6 Air Products and Chemicals Inc.
13.11 Advanced Specialty Gases Inc. Figure 52 SWOT Analysis: Airgas Inc. Figure 56 SWOT Analysis: Air Liquide S.A. Figure 58 SWOT Analysis: Air Products and Chemicals Inc.